Thanks to Juan Trinidad who has kindly provided the information in Italics on this page. Whilst this section talks about the Apotar lens - the procedure is basically the same for all of the lenses in Agfa folding cameras from about the mid 1930's. Similar lenses in other makes of cameras are probably dealt with in much the same way. Three set screws attach the focusing ring to the front element. They are also there for adjustment of focus. When unscrewing these BE CAREFUL. The screws seems to be made of aluminium. They are quite soft and easy to round. Note: It is not necessary to unscrew these set screws completely. Just untighten them a bit and leave them still partly screwed into the focus ring. This way they won't get lost. When the focus ring is removed you will have to remember exactly where it was or else you will have to recalibrate for focusing. "Recalibration is not too hard. When the front element is fully screwed in, that is already very close to the infinity setting." Having removed the focusing ring you can now get at the plate which covers the shutter. You can also dismantle the lens for cleaning. Taking the lens out is not as scary as it first seemed. 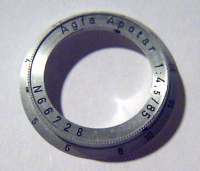 There are three lens elements on the APOTAR lens. The front, the middle and the back. The front element screws on the middle element for focusing. That is the part that seems to get stuck due to dried lubricant. You have to loosen this with strong solvents (contact cleaner, acetone etc...) before you grab each with pliers/wrench/vice grip (remember to wrap the parts with paper or cloth to prevent scarring). AVOID THE THREADS. You must not ruin the threads or else say goodbye to the camera. When loose, dip overnight in solvents to soften the dried lubricant. Then clean thoroughly with a cotton bud. You must take out all the dried lubricant. I used a needle to pick the stuff out of the threads. Clean the lens. The middle element screws on the aluminium threads of the shutter assembly. Clean the lens. To reset simply screw on fully into the shutter assembly. I suggest for you to use some thread lock here so that the middle element will not turn with the front element when focusing. The back lens screws on fully, no special setting necessary like middle lens. Clean the lens. After everything, you are now ready to put back the front element. Grease the threads with suitable grease (lithium, molybdenum or synthetic....who knows, I'm not a camera technician). Screw in fully. That is roughly the infinite setting. You may now need to adjust the focus.